Istria is Croatia’s northwestern peninsula, and the coastal region and cities of Istria were once part of the Venetian Republic. The Venetian influence in Istria is very apparent, especially in colorful coastal towns like Rovinj. Istria is also the foodie and wine capital of Croatia. Properly exploring Istria takes a few days, and Rovinj, one of the most beautiful coastal towns I have seen outside of Italy, is the perfect base for exploring the Istrian peninsula. 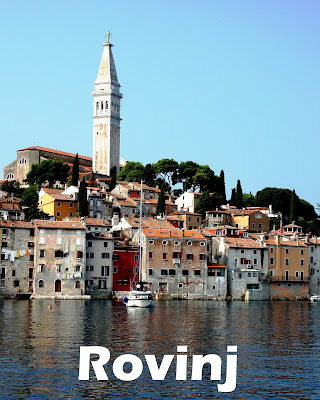 Rovinj is the best town in Istria to use as a home base for exploring the Istrian peninsula, and is also a beautiful town to explore in its own right. Rovinj has slippery smooth shiny marble cobblestone streets which are magnificently worn and weathered. We enjoyed strolling along Rovinj’s narrow and winding marble lanes. The crowning glory of Rovinj is the Church of St. Euphemia, located on the top of the hill with its bell tower reaching high into the sky. Walking along the coastal boundaries of the town provides breathtaking views of the colorful buildings as well as the opportunity to visit the market and watch fisherman unload their catch of the day. If you’re looking for a day at the beach, St. Andrew Island is just a short and easy ferry ride from Rovinj. St. Andrew Island is a tiny island and home to the Hotel Istra. The beach is open to the public and has lounge chairs and easy access to the water. Sunset as seen from the ferry back from St. Andrew Island. Istria is the foodie capital of Croatia, specializing in truffles. If you love truffles, Rovinj is the place to get your fill of truffles without completely breaking the bank. Rovinj restaurants are not stingy when it comes to truffles. Santa Croce is on the pricier side, but well worth it, especially given all the truffles. Our dinner consisted of a shared cold seafood platter, a shared truffle pasta that was out of this world, and steak with truffles for Romeo and angler fish with truffles for me. I can only imagine what that meal would have cost in the States. Taverna da Baston is a great choice for an inexpensive meal. Situated behind the outdoor market in a tiny restaurant with tables covered with plastic tablecloths, Taverna da Baston provides an unassuming casual dining experience with the freshest seafood. We had a simple meal of salad, fried calamari, and a whole sea bass which was cooked at the open hearth in the dining room. Our fish being cooked in Taverna da Baston's dining room hearth. If you want to stay in a beautiful and affordable hotel in Rovinj, Casa Garzotto is my hotel of choice. Casa Garzotto is a small hotel with just a few rooms located in a few different buildings. Our room was beautiful and spacious with hardwood floors, a fireplace, a small kitchen, and a view to the narrow cobblestone street below. The staff is friendly, gracious, and helpful. Rental cars must be parked outside of the town as only residents may drive through the streets of Rovinj. A member of the staff met us at one of the town gates, led us through the streets, and then parked our car outside of the town for us after unloading our luggage. The hotel also has a very good restaurant, Barba Zuane. Our spacious room at Casa Garzotto. Traveling to Istria will involve a lot of time driving around the Istrian peninsula visiting all the varied towns in the interior and along the coast. Having a beautiful base like Rovinj to start and end your travels makes the days even better. With its beautiful views in the morning, its romantic marble streets, and truffle-filled dining at night, Rovinj is my city of choice in Croatia’s Istrian peninsula. I planned our Croatia travels, including our time in the Istrian peninsula, using Rick Steves' Croatia & Slovenia and Frommer's Croatia. This post contains affiliate links. If you purchase through them you pay nothing extra and they help fund our travels.